Having following some leads which seemed to be dead-ends, we’d now stumbled on something that was shedding real light on these first Beatles amps. We still couldn’t tell how the Swiss amp fitted into the picture, but it was no longer some dead-end one-off. It seemed to be more and more closely connected, although there were questions still about which power connector it had originally been built with. We tried using some more side by side comparisons of the legends on the swiss amp and the different Beatles amps. While comparing pictures side by side the day before, we’d noticed that you could see the same white points in the same places on different photos, on the flat panel behind the valves. These must be the bolts holding the transformers in place. Having found more pics all suggestive of rivets on the Beatles amps to secure the cut-outs, we looked again at these indications of the transformer bolts, and found something rather unusual. Details of two different 7120s used by John and George on the German tour – left, used by George at Grugahalle Esssen, 25th June 1966; right, probably used by John, Grugahalle Essen, 25th June 1966. Here you can make out where the bolts are along the top edge, behind the valves; note too how close the bolts are to the top in the cramped space. (Barely any ventilation; the 7120 was made taller in production to try to help vent some of the heat, but the Beatles models must have been exceptionally hot, with transformers virtually scraping against the wood). The Swiss ones are different – much wider, heavier, and by inference capable of handling more power. The central core on the power transformer of a standard production 4120/7120 amplifier is about 5.8 cm (2 1/4″); the same core on this Swiss power transformer is almost 9 cm (3 1/2″). This isn’t an exact comparison obviously, but it’s enough to see how you can tell the size of the transformer behind. The Beatles ones and the Swiss one, seen from behind, have bolts that are hidden, or almost hidden at the bottom right, behind the second small valve. The Beatles bolts and the Swiss bolts look to be the same distance apart; the regular transformers though have bolts that frame the kt88 valve. It was fairly clear now that the Beatles amps had bolts placed differently, just like this Swiss amp, for the same bigger & heavier transformers. They also seem to have been riveted for a cut-out corner just by the mains switch, as the Swiss amp is. Now we knew what we were looking for, we could even see cut-outs in the metal cover over the valves. Our conclusion was that the Swiss chassis was indeed of the same time and style in nearly every respect as the Beatles amps. The Swiss chassis seemed to be showing us pretty much what the guts of the Beatles amps would have looked like. We could use it now to compare details we’d only seen in blurry shapes before, to compare things like the placing of legends. 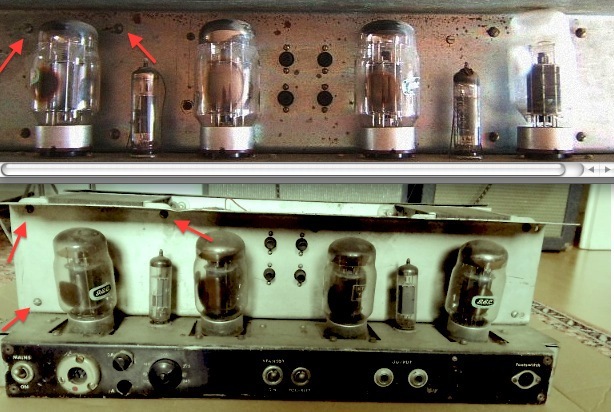 Each discovery was taking us much closer to the actual amplifiers used by the Beatles in 1966. Just how close, we were about to discover.